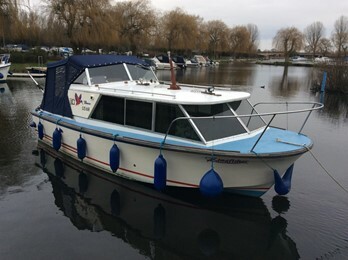 This is a tidy example of the Seamaster 23, and benefits from an economical diesel engine for river cruising. The deep V hard chine design was produced with hull and decking in one mould. The stiffness allowed for the very large window area this craft enjoys. This coupled with the open plan interior produces a cabin that is light and airy inside. The typical layout is 2 V berths to bow with conventional table dinette for a double berth. There is a separate toilet compartment and large galley area. Engines vary enormously from Wortham Blake petrols, Perkins 4107 diesels and some large Ford/OMC petrols. All models are connected to outdrives. Approx 350 were built.